Yoga Nidra session by Brahmachari Mukesh Kumar was there every day. Campers were made to sleep/relax consciously for 30 minutes. With simple instructions in the background of music made every one relax totally. It is a very good and efficient relaxation technique. 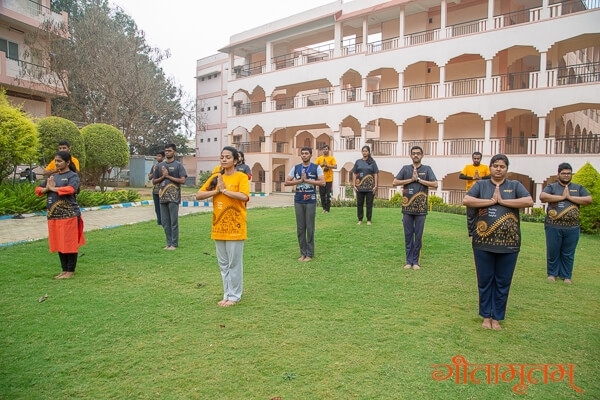 Yoganidhra was a very wonderful and amazing experience and it helped us to refresh ourself in a short span. It helped us become relaxed and also to get awareness. It was very relaxing and useful. He taught us how to sleep, but not with some dreams. He taught us how to relax and relieve our strain without a doctor. Sleep is the most powerful weapon in this world. Sleep gives us happiness. It was one of the most enjoyable sessions of the camp. I could hear only the first few words of Mukeshji and then I don’t remember anything. It was a very good recharge session. After this session I felt more cool and relaxed. It taught me how to concentrate on our own body parts while we are sleeping. Each and every part is precious in our body. This was like a stress buster. We got time to relax after some busy times. This concept should be implemented in the schools too!! The much awaited session of the day. It was a very relaxing session and as it was handled by Mukesh Swamiji, it added effect. I needed this. Kept me energetic the whole day! It is the only session where we got relief and it increased my awareness. The session that we all loved!! Mukeshji’s Yoga Nidra helped us to learn the right way to sleep. Gave peace of mind after the Nidra. No words. I had never observed or concentrated on my own body. Heartfelt thanks for that amazing session. It was indeed a refreshing session. Best session in the Gitmritam camp. Superb. Now I learned how to sleep properly. We got a nice and peaceful sleep in these sessions. He taught us the correct way of sleeping. Mukeshji, Thank you so much for being with us all these days. Your sessions and games were just awesome. Yoganidra sessions were just energizing and thank you so, so much for helping us out, despite having to going through that rigorous travel to reach us. Mukeshji, it was a mind blowing session and can’t forget it in my life ever. I was aware of this but in the sitting position. It was a huge change in the way I did and helped me in relaxing a lot and got my cervical pain relieved for hours. I have learned how to get deep sleep. The Yoganidra was very good. In Yoganidra we have to be in our awareness. It makes us feel refreshed. I really learnt how to sign off my mind when required. Learned much from this session, and from Mukeshji, he is my Guru. I learned how to sleep. I should thank Mukeshji for this because he took the stress out of us. We will miss you a lot, Mukeshji. Your soft melodious voice would lull us to sleep each day, well, at least for the first few days. Then, for the next two days you taught us that we could control our bodies even when asleep. Thank you for making us believe in ourselves and do something that we thought could not be done otherwise. The most wanted session by all of us and I get so relaxed when I do that. Well it was something. I always drifted to my semi-conscious mind. I don’t know if that is how it works,but I really felt peaceful after waking. Helped us to focus on oneself which we feel is the most difficult to focus on, although towards the end of the session I would fall asleep. It was really relaxing! It really helped to relax and also to forget everything else. Really enjoyed it. Every time I tried not to sleep but I used to fall asleep. Liked his humor and jokes.